According to the US Census Bureau, DC’s population started growing in 2006, and in the 13 years from 2005 to 2018 DC added 135,319 people, a 23.9% increase. Over that same time, according to CoStar, there was a net increase of 303 multi-family residential buildings containing 40,388 multifamily housing units, a 27.6% increase. Of the increase in multi-family housing, 74.3% of the buildings and 84.3% of the units occurred in what CoStar classifies as Class A buildings. These are newer, well-located apartments and condominiums with modern amenities. About 80% of the Class A units are apartments (see the appendix for more detail). Over the 13 years from 2005 to 2018 there was a 446% increase in units in Class A buildings compared to a 4.6% net increase in all other units. By 2013 DC had added 60.8% of the population growth that occurred from 2005 to 2018, but only 44.2% of the net increase in all multi-family housing units over the entire period—and only 39.0% of those in Class A structures. From 2013 to 2018 DC added 38.4% of the population growth that occurred from 2005 to 2018, but a much greater share (55.8%) of the net increase in all housing units in multifamily structures occurred then. The share of Class A structures added after 2013 was 61%. In 2013, the year of the largest annual gain in population, DC added 15,706 people and 2,078 net new multi-family housing units. In 2018 population growth was less than half (6,764) of what it was 5 years earlier while the net increase in housing units in multifamily buldings was more than twice as much ( 4,408). From the CoStar data on housing it is not possible to explain all of the dynamics that link population changes in DC to housing market developments. Clearly until 2013 most of the increase in population did not find housing in new Class A buildings. As we approach 2018, however, a much higher percentage of the growth could be housed in such units. In 2013 the ratio of population growth to net increase in multifamily units of all classes was 7.6. In 2018 that ratio has fallen to l.5. This means that the entire net increase in population in 2018 could have been housed in new (mostly Class A) housing if the average household size was 1.5. Going forward, an interesting question is how much of a limiting factor the availability of new Class A housing may to population growth in DC. There are quite a number of factors at play and so it is difficult to draw a firm conclusion here. For example, not all Class A units that are occupied (or rented) are necessarily occupied or rented by residents who would be counted by Census as part of DC’s population. This could involve persons whose primary residence is in another state, units owned for temporary housing of corporate personnel, or units owned for short term rentals. Also if persons now sharing units in DC move to newly constructed ones to live by themselves, occupied units would increase without any increase in population. The full story linking population and housing market changes must, of course, take account of all housing units in the city, not just those in Class A units in multi-family structures. As noted above, most of the Class A buildings are apartments. More details on Class A residential buildings are contained in the appendix. This is the second of two blogs dealing with population dynamics in the District of Columbia in relation to the latest US Census Bureau estimates of DC population. The population information reported here is from the DC population tables released in December 2018 by the US Bureau of the Census in connection with population estimates for the 50 states and the District of Columbia as of July 1, 2018. The data include revisions to the years 2010 through 2017, and all information is subject to further revision next year. Housing data is from CoStar, a real estate information firm that tracks all private sector apartment and condominium housing units in multifamily buildings with 5 or more units. Information for each year is for the second quarter, which corresponds closely to the July 1 date used by the Census Bureau for estimating annual population numbers. CoStar data is continuously updated and revised as more information becomes available. A version of this blog appeared in the January/February District of Columbia Economic and Revenue Trends report, issued by the DC Office of Revenue Analysis. Natural increase, not net in-migration, has become the main source of DC’s population growth. 2018 is the 13th straight year of population growth. From 2005 to 2018 population grew by 135,319, a gain of 23.9%. 60.7% of the net increase in population from 2017 to 2018 was accounted for by natural increase of 4,104. (Natural increase is births minus deaths.) The rest of the net change was from international migration. For migration within the US, 936 more people left DC than moved here. DC’s population was larger than that of 2 states (Vermont and Wyoming), and last year’s growth was more than in 16 states (9 of which actually lost population). In percentage terms, DC’s rate of growth was well above the US (0.6%) rate and above that for 36 states. Additional details on recent growth, revisions to past years, population change since 2000, and comparison with the 50 states are included below. Revision to the 2017 estimate. The July 1, 2018 DC population estimate of 702,455 is actually 8,463 higher than last year’s 2017 estimate. However, the increase over 2017 is now estimated to be 6,764 because revisions to population estimates in earlier years have resulted in a new estimate for 2017 that was 1,719 higher. The current estimate for 2017, 695,691, is 1,719 less than the prior one (693,972). As shown in the accompanying table and graph, the revision to prior years involved all the years from 2010 to 2017. The higher estimate for 2017 reflects the cumulative impact of increases and decreases since 2010. Although the level in 2017 was higher, growth in 2017 over 2016 was actually lower (by 520 persons). Natural increase has become the major contributor to DC’s net population growth. This past year natural increase accounted for 60.6% of the increase; its average contribution since 2010 was 37.4%. Although births and deaths last year both exceeded their annual averages since the census, natural increase was less than the post-census average because deaths increased more than births. Domestic migration is no longer a source of net growth for DC. Net domestic migration contributed 29.3% to growth since the census, but now more people are leaving DC for other parts of the US than are arriving from them. International migration has become a more important source of growth for DC. It was the source of 32.0% of the net increase in DC’s population in the years since the census, and 53.1% of the growth last year. DC’s population increase exceeded that in 16 states (9 of which lost population). DC’s natural increase was greater than in 11 states (2 of which were negative). DC’s net domestic migration was less negative than in 26 states. DC’s net international migration was greater than in 18 states. Details on comparisons with the states for 2018 and for changes from 2017 to 2018 are shown in the appendix. About the data: This is the first of two blogs dealing with aspects of population growth in the District of Columbia. The information reported here is from the tables released in December 2018 by the US Bureau of the Census in connection with population estimates for the 50 states and the District of Columbia as of July 1, 2018. Those tables include (1) total population; (2) population as of April 1, 2010 in the decennial census and as of July 1 of each year from 2010 through 2018; (3) components of population change from July 1, 2017, to July 1,2018; and (4) components of population change from April 1, 2010, to July 1, 2018. The components of change are natural increase (with births and deaths shown separately) and net migration (with international and domestic migration shown separately. The data include revisions to the years 2010 through 2017. A version of this blog appeared in the December 2018 District of Columbia Economic and Revenue Trends, issued by the D.C. Office of Revenue Analysis. Are growth of the labor force and resident jobs slowing in DC? Maybe—and maybe not. Each month the US Bureau of Labor Statistics (BLS) estimates labor market statistics for all states and the District of Columbia. Labor market statistics include the labor force, resident employment, unemployment, and the unemployment rate. The data is reported on both a seasonally adjusted and unadjusted basis. Seasonal adjustment takes account of recurrent events during a year such as holiday employment that can mask trends in the data. Typically, comparing data from the same month of the prior year eliminates the need for seasonal adjustment. 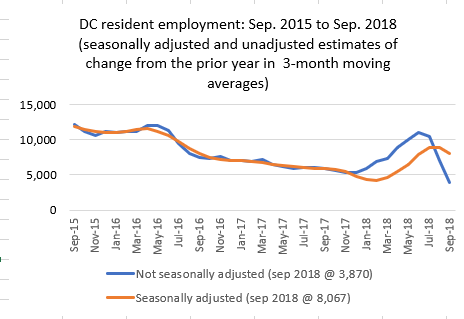 Accordingly, it would be expected that there should be little difference between seasonally adjusted and unadjusted estimates of the annual change in DC resident employment from September 2017 to September 2018. 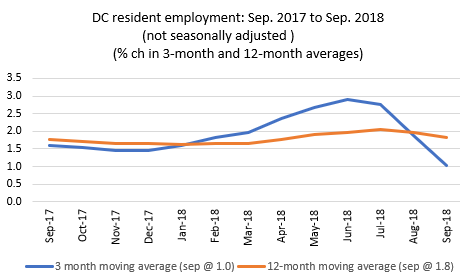 Currently, however, the two data sets give very different pictures of the change over this time, leaving unanswered the question as to whether DC’s resident employment is or is not slowing significantly. 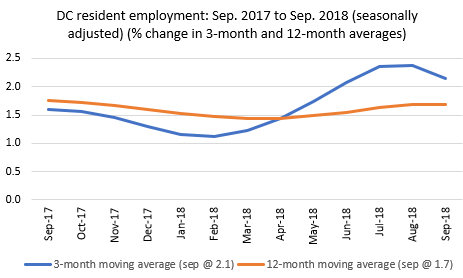 The seasonally-unadjusted data say that from September 2017 to September 2018 resident employment (measured by the 3-month moving average) increased by 3,870 (1.0%). By contrast, the seasonally-adjusted data peg the increase at twice that (8,067, a 2.1% gain). The unadjusted data show quite a sharp decline in the amount of year-over- year growth since May 2018, while the adjusted data show an increase. The unadjusted data peg growth over the past year at about half the annual average increase over the past 5 years. Seasonally adjusted, the growth is very close to the average of the past 5 years. Details are shown in the tables and charts in the appendix. As indicated there, the story is similar for the seasonally adjusted and unadjusted estimates of DC’s labor force. The current difference between the one year change in the seasonally adjusted and unadjusted resident employment and labor force data is an unusually clear example of the difficulty in spotting changes in the economy by closely monitoring data as it is released each month or each quarter. As with Personal Income, population, and other data produced by federal agencies, labor market data is revised as more information becomes available. 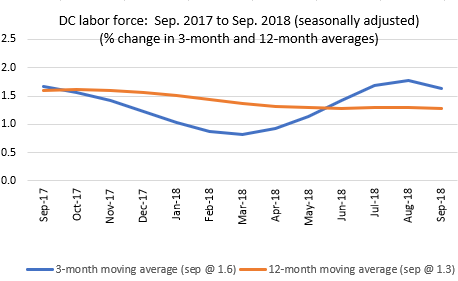 As the labor force data is revised the current differences in the story about changes over the past year told by the seasonally-adjusted and unadjusted data will be resolved. However, it will likely not be until March 2019 when major annual revisions typically occur that the matter will be cleared up. It should be noted, however, that the seasonally-adjusted and unadjusted data both tell the same story about unemployment: the amount and rate of unemployment fell over the past year. About the data. The labor market information is from the statistics released each month for the District of Columbia (along with all states) based on a population survey. The data include resident employment (persons over 16 years of age who say they are working on a full or part time basis); unemployment (persons over 16 years of age who are not working but say they are looking for work); labor force (the sum of resident employment and unemployment); and the unemployment rate (unemployment as a percentage of the labor force). The data are reported on both a seasonally adjusted and not seasonally adjusted basis. For the month of September 2018 the data reflect the revisions which were part of the October 2018 release. The annual comprehensive revision to the data will occur in March 2019. 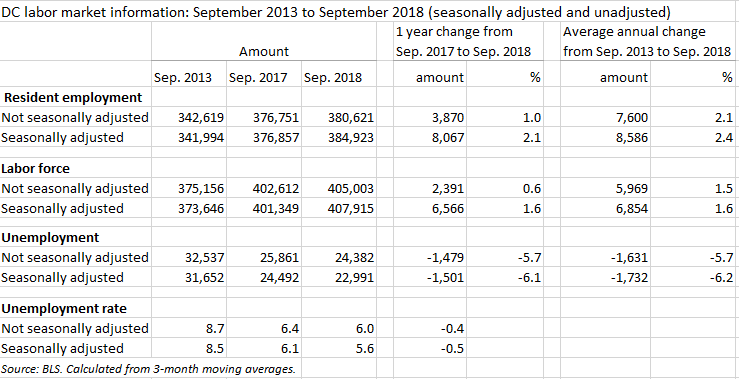 All calculations here are based on 3-month moving averages (e.g., September 2018 is the average of July, August, and September as reported by BLS). Seasonal adjustment is a statistical method for removing the seasonal component of a time series that exhibits a seasonal pattern. It is usually done when wanting to analyze the trend of a time series during a year independently of the seasonal components. It is common, for example, to report seasonally-adjusted data for unemployment rates to reveal the underlying trends in labor markets. An earlier version of this blog was included in the October 2018 District of Columbia Economic and Revenue Trends report issued by the Office of Revenue Analysis of the District of Columbia Office of the Chief Financial Officer. From 2012 to 2017 DC’s inventory of apartment and condominium housing units grew by a net of 22,348 according to CoStar, a real estate information firm that tracks developments in the District and many other locations. This 13.7% increase in housing units is a major element in the growth of DC’s population over that time, a relationship that will be looked at shortly. But first, a few details on the recent changes to the District’s stock of apartment and condominium units. The number of new units delivered over the five years was 23,099, but 775 units, about one-half percent of DC’s stock of multifamily housing in 2012, were demolished or otherwise went out of existence. The number of vacant apartment units increased by 2,374 over the past 5 years, and the vacancy rate rose from 6.5% in 2012 to 7.3% in 2017. New construction at the end of 2017—11,179 apartment units and 1,614 condominium units—essentially continues the pace of recent development activity. It will take two or more years for all of this existing construction to deliver new units to inventory, and the amount of this new construction is more than half of the net increase in units that occurred over the previous 5-year period of 2012 to 2017. For apartments current construction is 56% of the prior 5 year net increase in units, and for condominiums the percentage is 74%. Detail for each of these points are in the tables in Appendix 1. The number of occupied apartment and condominium units grew by 19,930 from 2012 to 2017. This is almost 2,400 less than the 22,348 net increase in inventory, but in percentage terms the gain in occupied units—12.9%—was greater than that of population over that time (9.2%). Newly occupied apartment and condominium units clearly represent a major element in the demographic changes occurring in DC. Available data does not, however, make it possible to know exactly how much of the 58,342 growth in DC’s population from 2012 to 2017 was accommodated by the net increase in occupied apartments and condominiums described in the CoStar data. A judgment on this depends on the additional number of households associated with the increase in population—and this can only be estimated. Definitions further complicate the task of trying to compare Census and CoStar information. For the Census Bureau, a household is equivalent to a housing unit occupied by DC residents. The resident household can be a single person, a small family, a large family, or a group of unrelated persons who share the unit. To be classified as occupied by CoStar, however, a unit need not only be occupied by a DC resident household (as defined by Census). Occupied units from the point of view of a property owner can also involve second homes, short-term rentals, corporate accommodations for employees and guests, units in transition waiting for a new owner or tenant to move in, or ones undergoing repairs. The growth in occupied units as defined by CoStar can thus easily exceed the increase in households as defined by Census. That said, a reasonable place to start in connecting population increase to change in apartment and condominium occupancy is with the Census. In 2000 the ratio of population to households was 2.30, a ratio which fell to 2.27 in 2010. In that decade, the number of households grew faster than population (7.4% compared to 5.8%), and the ratio of the increase in population to the increase in households was only 1.80, suggesting that one of the features of population growth at that time was small households. What of the period between 2012 and 2017? Was the increase in small households so great that the number of households grew faster than population, and the population/household ratio continued to get smaller? Or did population grow faster, resulting in a rise in the ratio? Among the factors contributing to this latter result would be more children and more people doubling up due to affordability issues. Assumptions about an appropriate population/household ratio makes a big difference in assessing how many new households population growth has brought—and how much of that growth was accommodated by occupancy growth in apartment and condominium buildings. As noted above, the 2010 average population/household ratio was 2.27. That ratio applied to population growth over the 2012 to 2017 period yields an estimated growth in households of 25,701, a number that exceeds CoStar’s estimate of the increase in occupied units by 5,771. The 2012-2016 American Community Survey 5 year estimate pegs the population/household ratio at 2.38. Applying that higher ratio gives 4,583 as the amount by which household growth exceeded the increase in occupied units. With ratios a little higher or lower than these averages new household growth exceeds the growth in occupied units. Only if the population/household ratio rises to 2.93 does the new household estimate equal that for the growth in occupied units. Under a range of plausible assumptions it appears likely that the District of Columbia added more households over the past five years than could live in newly occupied units in new apartment and condominium buildings. If this is the case, this means that other components of the housing stock—structures with four or less units—must have been able to absorb some of the increase in population. Taken as a whole, the DC housing stock does provide room to accommodate some of the growth in population in units other than those in new apartment or condominium buildings. The Census Bureau’s American Community Survey estimated that for the 5-years 2012 through 2016 there were 306,711 housing units in DC, and that 160,750 (52.4%) of those units were in structures with 5 or more units. In other words, almost half of DC’s housing stock is in smaller buildings. Over the past 5 years more than 1,000 permits have been issued for projects with less than 5 units, and many smaller buildings can be reconfigured to accommodate more units. With the current pace of construction for apartment and condominium buildings much like that of the past few years, multi-family apartment and condominium projects will undoubtedly provide the largest share of the additional housing needed for DC’s growing population—provided, of course, that a sufficient number of households can afford to live in them. But the connection between increases in population and changes in the housing stock is a complex one, and DC’s changing demographics involve more than simply building large new apartment and condominium buildings for new people. Gross and net changes to inventory. About the data. Data on DC multi-family housing buildings and units are for apartments, condominiums, and co-operative apartments of all classes in structures with 5 or more units as reported by CoStar, a real estate information company. The data was accessed toward the end of April. Population data and data from the American Community Survey are from the US Bureau of the Census. The housing and population data are all subject to revision by the source as more information becomes available. This analysis looks solely at the statistical relationships between changes in DC population, households, and housing units. It does not address issues related to affordability or homelessness. An earlier version of this blog was included in the April 2018 District of Columbia Economic and Revenue Trends report issued by the Office of Revenue Analysis of the District of Columbia Office of the Chief Financial Officer. In March the US Bureau of Economic Analysis (BEA) released its estimate of income in the District of Columbia for the last quarter of calendar year 2017 along with revisions to the prior three quarters of 2017. 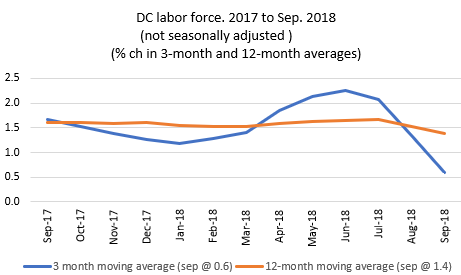 Also in March, the US Bureau of Labor Statistics (BLS) revised labor force data for the past several years for wage and salary jobs located in DC and employment of DC residents. Taken together, these new data provide a more positive picture of the District’s economy as the year drew to a close. Income growth for DC residents is increasing. Resident employment is rising and unemployment is falling. Other sectors are picking up some of the slack in jobs and income from weakness in the federal sector. Income in DC. The change in income is particularly striking. From the previous estimate it appeared that DC’s Personal Income growth was continuing to slow down in the 3rd quarter of 2017, falling to a rate of 2.2%. The new data raised the 2017.3 rate to 2.8%, which then jumped to 3.8% in the 4th quarter. Instead of a picture where income growth in the District continued to slow while the US increased at a faster rate, now DC’s Personal Income growth is estimated to be growing much closer to the national average. Resident employment is rising and unemployment is falling. The new data show that resident employment increased by 1.5% from 2016.4 to 2017.4, no doubt a contributing factor to rising incomes of DC residents. The recent revision to the labor force data made a modest change to the end of year level of resident employment (a 0.3% increase of 976). The revision made a substantial change, however, to the picture of unemployment in DC. Whereas before it appeared that unemployment had increased by 1,479 from 2016 to 2017, the new data shows that it fell instead by 391. The primary reason for the decrease in unemployment, however, is that the revision reduced the amount of growth in the labor force while making little change in resident employment. Picking up the slack. 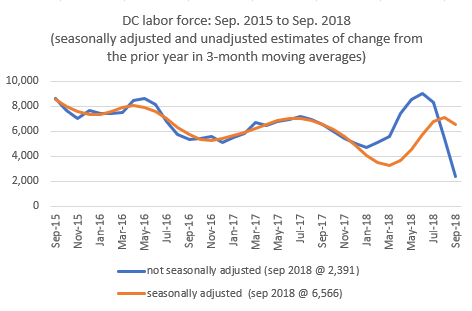 Revisions to the employment data made no material change in the number of jobs in DC at the end of the year (797,667, 200 less than previously estimated), or to the amount and rate of change (a 1% increase of 7,800, 133 more than previously estimated). The new data shows, however, that the federal sector lost 3,433 jobs from 2016, a 1.7% decline. Similarly, although federal wages grew by 3.1% from 2016 to 2017, this rate was little more than half that for the economy as a whole (5.7%). Although still by far the largest sector in the District’s economy, over the past year the federal civilian share of jobs slipped to 24.8% and its share of wages slipped to 30.5%. One of the positive elements in the new employment and income data is the extent to which other sectors of the economy seem to have picked up some of the slack resulting from weakness in the federal sector. On the job side, all other sectors of the economy grew 1.9%, faster than the US average of 1.6% for all non federal jobs. Wages of all other sectors of the economy grew 7.0%, faster than the US average of 4.7% for all non-federal wages and salaries. The new data show a shift in the composition of employment and wages in a way that, on balance, give a picture at the end of the year of increasing diversity in the industry mix of the District’s economy. 5,633 jobs were added to year-over-year employment change in four sectors: health, information, professional and technical services, and personal services. Instead of appearing to lose almost 200 jobs from 2016 to 2017, this group gained almost 5,500. Almost three-quarters of the revised gain in wages in the 2017.3 quarter occurred in five sectors or subsectors: Information, real estate, management, arts and entertainment, and organizations and personal services. These five sectors accounted for only 17% of all DC wages in the last quarter of 2017. Those five areas also accounted for 39% of all wage gains from 2016.4 to 2017.4. About the data: The information is regularly reported information from the US Bureau of Labor Statistics (BLS) and the US Bureau of Economic Analysis (BEA). BLS publishes monthly statistics of wage and salary employment for the US and all states (including DC) and each March revises data from the prior years based on the availability of additional information. This analysis uses the amount for the years 2016 and 2017 as originally issued in December 2017 and the revised data for those years issued in March 2018. BEA issues Personal Income and other income statistics each quarter, often revising information from prior periods. This analysis uses the December 2017 release for 2016 and 2017 (through the 3rd quarter of the year) and the March 2018 release that revises prior data and includes the new estimate for the 4th quarter of 2017. Data used here may be subject to further revision by the agencies. An earlier version of this blog was contained in the March 2018 District of Columbia Economic and Revenue Trends report. Net in-migration is the principal explanation for DC’s relatively rapid population gains. In other words, more people moved in than moved out. Net migration into DC of 57,912 accounted for almost two-thirds (63.7%) of the city’s population increase. DC’s net migration was greater than in 31 states. It represented a 9.6 % increase over DC’s total 2010 population, a higher percentage gain from migration than in every state except Florida (10.3%). DC’s net migration was almost evenly split between international (47%) and domestic (53%). The amount of net international migration into DC topped 14 states, but net domestic migration was even more striking: DC outpaced 35 states. Migration also contributes to the part of DC’s population gain resulting from natural increase (which is births minus deaths). According to the Census Bureau about one-third (36.3%) of DC’s population increase from 2010 to 2017 was due to natural increase. It should be noted, however, that many of the births that occurred in DC must have been to parents who migrated into the city during those seven years. In addition, the relatively young age of many migrants meant that few of them died in those years. In DC there were only 51.7% as many deaths as births over the period whereas for the US as a whole there were 66.1% as many deaths as births. Consequently, although DC had more births than only two states, the natural increase in DC’s population from 2010 to 2017 was greater than in 9 states. Migration and age groups in DC. According to the economic forecasting company IHS Global Insight, 85% of the increases in DC’s population from 2010 to 2017 fell in two age groups: (1) 25 to 44 years and (2) under 15. Although migration can occur within any age range, these two age groups are closely tied to migration. From 2010 to 2017 DC’s population between the ages of 25 and 44 grew by 54,071, a 26.3% increase that accounted for 58.6% of all growth in the city from 2010 to 2017. It is not possible to know how many of the additional 54,071 persons in this age group were migrants, but it can be no coincidence that this increase is close to the 57,912 net migration into DC reported by Census for the period. This age group is mobile and can easily move for employment reasons—and is also the age group most likely to have children. From 2010 to 2017 DC’s population under 15 years of age grew by 24,436, a 29.2% increase slightly higher than that for the 25 to 44 age group. Accounting for 13.9% of the city’s population in 2010, children under 15 accounted for 26.5% of all growth from 2010 to 2017. Again, it is not possible to know how many of the additional children of this age either accompanied persons migrating to DC or were born to such migrants after they arrived, but surely many were. The scale of the changes in migration and age groups that occurred between 2010 and 2017 would be expected to have many influences in the District’s economy, and this has been the case. For example, according to CoStar, a private sector firm that collects data on apartments and other commercial real property, from the first quarter of 2010 to the second quarter of 2017 there was an increase of 21,492 in occupied market rate apartment units in the District of Columbia. Similarly, enrollment in DC Public and Charter schools increased by 17,139 from the 2009-10 to 2016-7 school years, a 23.5% gain. Increases of these magnitudes in housing and school enrollments would not have been possible without the net in-migration experienced in DC from 2010 to 2017. The course of net migration will continue to have a great deal of influence on the the District’s economy. Migration is a net concept, meaning that it is the difference between those moving in and those moving out, so the questions surrounding migration have to do both with DC’s ability to attract new people and to retain those that are here. According to Moody’s Analytics, an economic forecasting company, the nation’s population in the 20 to 30 age group is actually expected to decline over the coming years. From the first quarter of 2010 to the second quarter of 2017 there was a 22.6% increase in the 25 to 29 age group, whereas in the next five years Moody’s expects a 3% decline. To maintain its past inflow of young adults in this age group DC would therefore have to attract a larger share of the national total than was true of the past few years. In attracting people to DC an important question is also the city’s continuing ability to attract workers over 30 years of age who are not coming here for first or entry level jobs. For retaining people who are here the key questions center on those 25 to 44 year-olds who have been at the center of DC’s recent population growth. What share of this age cohort will find sufficient job opportunities and housing options and secondary school options to keep them committed to staying in the District of Columbia? There are, of course, many factors affecting migration into DC that are beyond the city’s control. These include developments in the national economy, federal spending policies that can make it easier or harder to find employment in DC’s key industry, and national policies affecting immigration that might reduce net international migration not only to DC but elsewhere in the country. This is the third of three blogs on DC population based on the December 2017 estimates of the US Census Bureau of DC population in 2017. The population data for the District of Columbia for April 2010 and July 2017 are estimates from the US Bureau of the Census. The July 2017 data for DC and all of the states were released in December 2017 and contains an analysis of the components of natural increase and migration that explain the net changes in population from 2010 to 2017 for the US and for each jurisdiction. Data on the age composition of DC population for the first quarter of 2010 and the second quarter of 2017 are estimates from the economic forecasting firm IHS Global Insight. Changes in the 25-29 year-old age cohort in the US are from the economic forecasting firm Moody’s Analytics. Data on occupied market rate apartment units in DC in 2010.1 and 2017.2 are from CoStar, a real estate information firm that tracks development in the District of Columbia and elsewhere in the nation. Data on yearly enrollments in DC Public and DC Charter schools is from the DC Public Charter School Board. An earlier version of this blog appeared in the February 2018 District of Columbia Economic and Revenue Trends report issued by the District of Columbia Office of Revenue Analysis, a component of the District of Columbia Office of the Chief Financial Officer. The Census Bureau has estimated DC’s population at 693,972 as of July 1, 2017. This is the third time DC’s population has been at that level. The first time was in 1941—on the way up to becoming 900,000 (reached in 1943). The second was in 1976—on the way down to a level of 566,000 (reached in 1998). This third time population is rising again, having grown by 127,000 (22.5%) from the 1998 low point. In 1941 employment growth related to New Deal programs and World War II had attracted many people to the city. Population soon soared to 900,000 but started to decline at the war’s end. Even after losing about 100,000 from the war time peak, DC was the 9th largest city in the nation in 1950 with a population of 802,178. US population more than doubled from 1950 to 2016, but DC’s declined by 15% over that time, and its rank among cities fell to 21. Measured by percent change in population, however, DC fared better in those 66 years than all but 3 of the 1950 cohort of the top 12 cities. DC since 1950. The 1970’s knocked DC out of the ranks of the nation’s 12 largest cities. DC held onto the 9th spot in city ranking through 1970 despite population declines in the 1950’s and 1960’s. But the city lost 188,000 people, a 15% decline, in the 1970’s and its rank fell to 15th in 1980. After losing another 65,000, DC was ranked 21st in 2000, and population gains beginning in 2005 were not sufficient to keep the city’s rank from slipping a little further to 24th in 2010. With growth continuing, DC rose to 21st among US cities in 2016, and it is possible that the rise in population that has brought it to the 694,000 mark for the third time in its history may lead to higher relative city ranking as well. The 1950 cohort of top cities 66 years later. Much has happened since 1950, but DC has actually fared better than most of the top dozen cities of that year. As a group, these dozen cities lost 1.9 million people, 8.1% of their population, and the share of the nation’s population living in them went from 15.4% in 1950 to 6.6% in 2016. Of the top 12 cities of 1950, 9 lost population. Only New York, Los Angeles, and San Francisco grew. Only four of the cities remain in the top dozen: New York, Chicago, Philadelphia, and Los Angeles. The 121,008 decline in DC’s population was the least of all 9 cities that lost population. Detroit lost the most (1,176,773). The 15.1% decline in DC’s population was also the least of the 9 cities that lost population. Four cities lost 50% or more of their population: Detroit, Cleveland, St. Louis, and Pittsburgh. Many long time residents of Washington DC are conscious of local developments that have contributed to population declines over the years including such things as urban renewal, flight to the suburbs, public safety concerns, quality of city services, and bankruptcy of the city government. However, all of the large cities of 1950 were affected by enormous changes in the US economy. Industries changed and population shifted to southern and western locations. It is noteworthy that DC’s loss in population in this changing world was less than for most of the1950 cohort cities. Being the nation’s capital, the location of substantial federal government employment and procurement spending, seems to have provided DC with an important measure of stability. Once again passing the 694,000 milestone in 2017—this time going up—shows that the city is still able to attract jobs and people in today’s continuously evolving economy. The newcomer cities. As noted above, only four of 1950’s top cities are still among the dozen largest in the US. The departing 8 cities, all from the East and Midwest have been replaced by four from Texas, two from California, and one each from Arizona and Florida. Taken together, the newcomer cities increased by 8.7 million, a 375% gain. The largest gain, however, was Los Angeles, not a newcomer, which added 2.0 million and doubled in size. The biggest percentage gain was Phoenix at 1,412%. In 2016 the top dozen cities accounted for 8.6% of the US population, a share close to half as much as the share (15.4%) the top 12 cities had in 1950. Of the increase in US population from 1950 to 2016, just 5.8% occurred in the nation’s top dozen cities. Traditional big-city boundaries seem thus to have diminished somewhat in relative importance even as the nation has continued to urbanize. This is the second of three blogs about DC population based on the US Census Bureau estimate of DC population in 2017 released in December 2017. The population data for the District of Columbia, other US cities, and the US is from the US Bureau of the Census. The data is for incorporated cities and not for the metropolitan areas of which they are a part. Annual data back to 1939 is accessed from Moody’s Analytics. Data for city rankings is accessed from the website https://www.biggestuscities.com. In the city ranking tables, 2016 data for DC do not reflect the revision made in December to that year by the Bureau of the Census. A version of this blog first appeared in the January 2018 District of Columbia Economic and Revenue Trend report issued by the District of Columbia Office of Revenue Analysis, a component of the District of Columbia Office of the Chief Financial Officer. This blog was revised on March 22 to clarify that the graph on p. 1 was population only.